I really love a lot of things. Two of them are old fire engines and trading patches. I met a firefighter the other day from the Wilson Fire Department in CT. I did not have a chance to get a lot of information on the department and when I looked it up on the internet I did not find much either. The interesting part about the department is that they have a functioning 1901 Amoskeag steam engine. I found a little bit of information from the Connecticut Historical Society and the Connecticut Fire Museum. In the picture below: The new propeller, No. 4, extra size Amoskeag, known as the Pride of Hartford. It was the largest engine of its kind at the time. The photo was taken in front of the station at 60 Ann Street. At the throttle, Engineer John C. Moran; in rear, Assistant Engineer Charles F. Grundt; and at the wheel, Tillerman Warren A. Bingham. Photo by William G. Dudley, probably 1901. The original image is here. at the Connecticut Historical Society website. 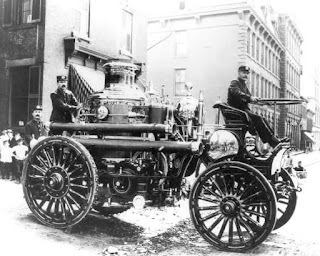 According to the book Greater Hartford Firefighting (CT) (Images of America) the engine was retired in 1925 and later moved to the Wilson Department.